Fresh hot potato croquettes are an easily achieved homemade culinary pleasure. There are two keys to turning out good ones every time. The first, a well-proportioned balance of flour, egg and potato….too little flour and the croquettes may fall apart as they fry…too much and they become heavy and pasty. The second necessity is oil heated sufficiently for deep frying them…too little heat and the croquettes burst apart before they are done. The recipe given below ended the diplomatickitchen’s search for one that would turn out excellent croquettes on a regular basis. It comes from the website bavariankitchen.com–a useful source for traditional Bavarian and other German recipes. 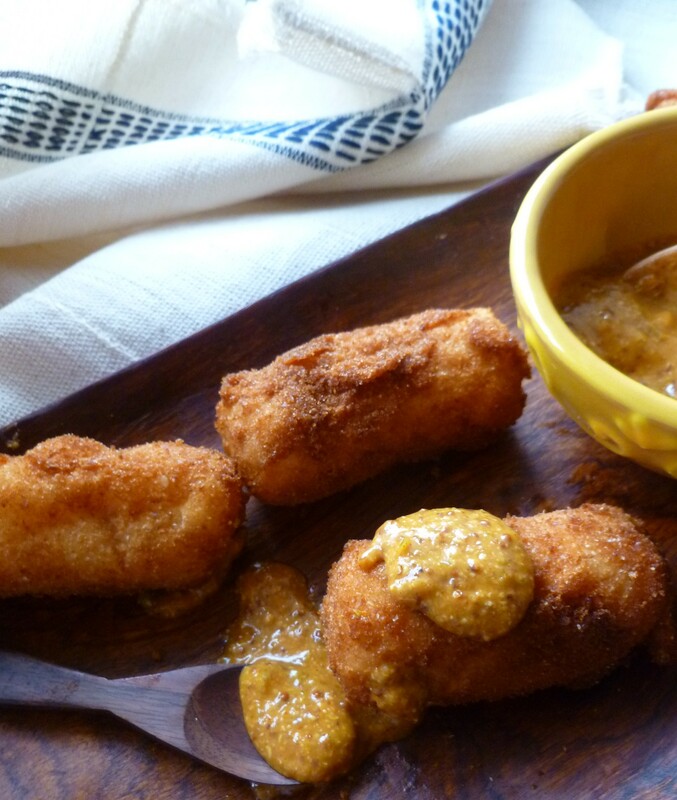 The companion piece, to serve with the croquettes, is Orange Remoulade, an accompaniment a little out of the ordinary, and, at once, exceedingly good and easy to make. Timing Note: After running the potatoes through a food mill, they are cooled to room temperature….30 minutes is a good estimate for the cooling time. Allow at least 30 minutes for chilling the Orange Remoulade after it is blended together. 2. Run the potatoes through the food mill fitted with the large-holed plate (if your mill comes with multiple plates) into a large bowl. Set them aside to cool to room temperature…for, perhaps, 30 minutes. 3. Separate the egg, placing the white in a small bowl and adding the egg yolk to the cooled potatoes. Mix the yolk into the potatoes well, along with the butter, flour, salt and nutmeg. 4. Beat or whisk the egg white until it is frothy. Spread out dried bread crumbs on a plate. Place the bowl of egg white and the plate of crumbs out on your work area. 5. Knead the potato mixture briefly with your hands. Form the mixture into golf ball sized balls and shape the balls into cylinders like the ones shown in the Ingredient photo above. 6. 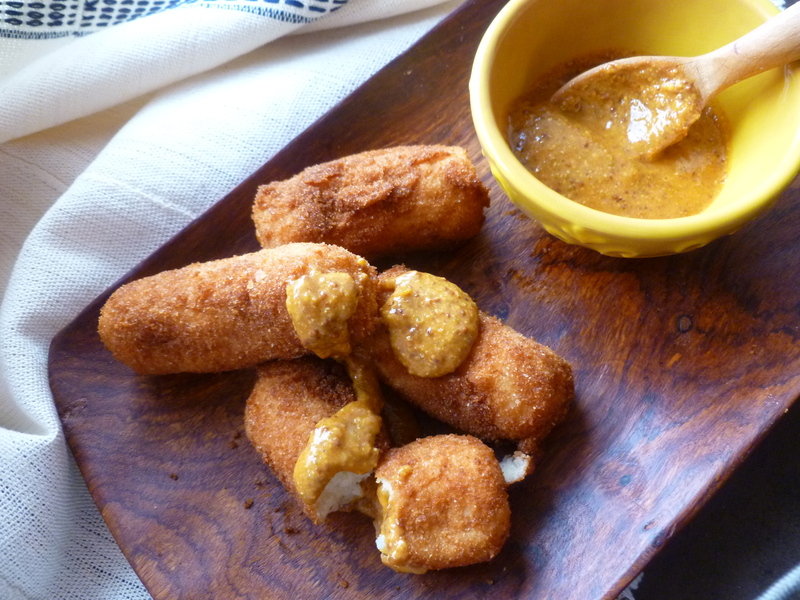 Bread the croquettes: Dip each in the egg white and then roll it in the bread crumbs. Place them as they are breaded on a plate or baking sheet. 7. Pour enough vegetable oil into the pot so that the croquettes will float freely as they fry. Heat the oil to 350 F. Carefully lower 4 croquettes into the oil with a slotted spoon, one at a time, and fry them, turning them occasionally with the slotted spoon, until they are golden brown….This will take only a few minutes. 8. With the slotted spoon, remove the croquettes to the brown paper or paper towel-lined baking sheet to drain. 9. Bring the oil back to 350 F before adding the next 4 croquettes for frying. 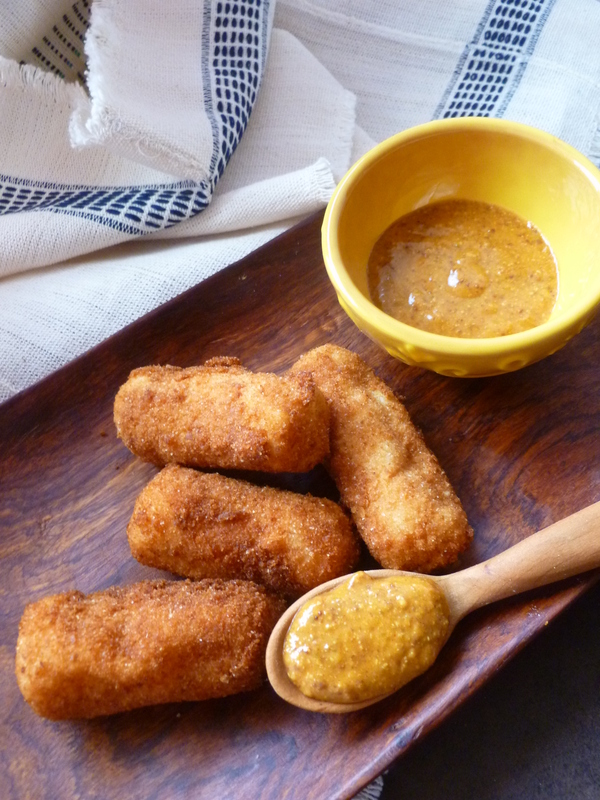 Continue frying the rest of the croquettes in the same manner. 10. Serve the hot croquettes at once. The Orange Remoulade Sauce described below in a good addition to them. A Note: Potato Croquettes with Orange Remoulade accompany the Main Course of the Lunch Menu: A Lunch with Spice and Many Things Nice. 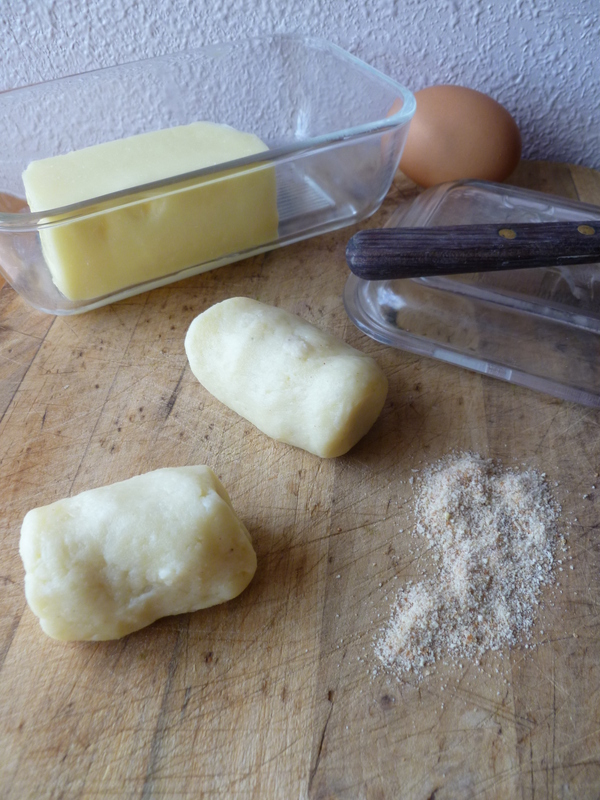 Two Acknowledgements: The recipe for the croquettes is adapted from one on the bavariankitchen website. The sauce recipe is an adaptation from one found, curiously enough, in an excellent cookbook about ‘Cowboy’ Cooking: Cooking the Cowboy Way by Grady Spears and June Naylor (2009). 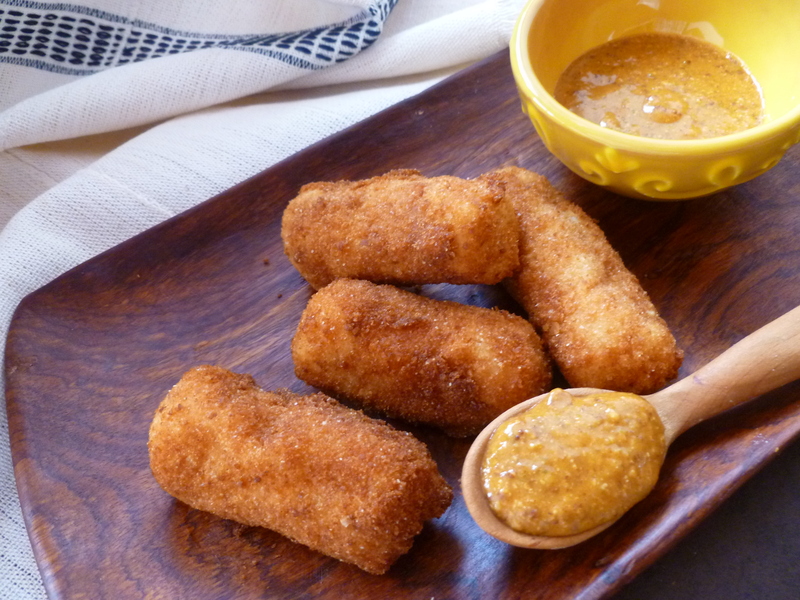 Mouthwatering croquettes! I am intrigued with the orange rémoulade sauce, it must have been delicious. Thank you! The sauce goes well with ‘frites’ too.